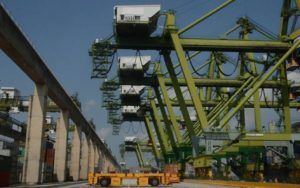 PSA International is currently testing automated quay cranes (AQCs) at its Pasir Panjang Terminal in Singapore to enhance efficiency of operations and improve working conditions for crane operators, Channel NewsAsia informs. 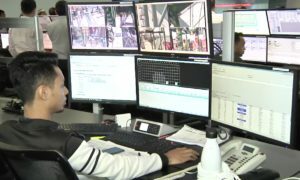 Instead of sitting in a booth of an STS crane 17 storey high, the operators will be monitoring the work of their cranes remotely from a control centre in an air-conditioned office through the AQC system. In total, 40 crane drivers have been trained to use the system since 2016 and the company plans to train all of its 500-600 operators to be able to use it. The AQC system allows part of the container moving process – from a vessel to an automated guided vehicle (AGV) – to be done automatically, but the exact positioning of a container onto the ship or a vehicle still requires an operator using a joystick. However, the engineers are working to make the whole process automated with only minimal human supervision needed. The AQC system has been piloted at Pasir Panjang Terminals 4,5 and 6 since the first half of 2018 on three AQCs produced by the Chinese equipment manufacturing company ZPMC. Besides, 30 AGVs are also presently on trial to be used alongside the automated quay cranes to transport containers between the berth and the container yard. Of these AGVs, 8 are hybrid and 22 are fully battery operated. The new system is being implemented within the USD 3.5 bln development programme at Pasir Panjang, which will see the expansion of the terminal’s capacity up to 15 mln TEU on 15 berths with a 18m draft to cater for mega-containerships. PSA also plans to use the AQC system at the Tuas mega port. As we wrote earlier, the Tuas Terminal is the next generation container facility currently under development in Singapore. Targeted for completion in 2040, it will become the largest container terminal in the world, with a total capacity of up to 65 mln TEU, where all current Singapore container terminals will eventually be relocated and merged. The AQCs will feature already at Phase 1 of the Tuas mega port scheduled to start operations in 2021.